Released: 1993. Genre: Strategy; Shoot 'em up. Other versions: PC; SNES; SMD; AST; JAG. When I finally get round to writing my "Big Book of Gaming Heroes" one software development company from the late eighties and early nineties will feature quite prominently. The simple genius of Parallax, a multi-directional shoot 'em up that was one of the first Commodore 64 games to utilise parallax scrolling, and the off-beat daftness of Wizball would normally be enough to have Chris Yates' and Jon Hare's Sensible Software in any gaming Hall of Fame. But then these are also the awesome dudes that magically crafted Sensible Soccer (still the greatest football game ever made) and Cannon Fodder for the masses, two of the most memorable Amiga titles from yesteryear. Back in the day few software houses (the Bitmap Brothers perhaps) could boast such classics to their name. 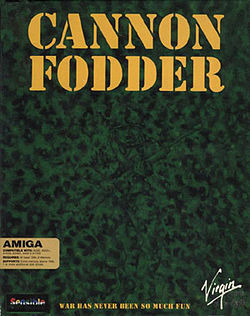 Cannon Fodder boasts much of what made Sensible gaming so effective. Incredibly easy to pick up and play, yet as tough as a wizened old nut to crack. Oh, and it has tongue very firmly in cheek. Charging around multi-directional backdrops (comprising jungle, arctic, desert, underground bunker and even farmyard settings) with a small outfit of troops looking to kill all enemies and destroy all buildings is a wonderfully simple concept. The first mission is merely a static one-screen map with three enemies. All that is required is to shoot and kill these numpties with the two troops provided. Easy and instantly hookable! The controls are equally simple to master. Pointing and left-clicking on the mouse moves your men about, right mouse clicking has them fire in the direction the cursor is pointing, holding both buttons down allows you to throw a grenade. Troops can be split into teams along with jumping into the odd vehicle as and when necessary, allowing for more strategic and tactical elements to be employed in later missions. 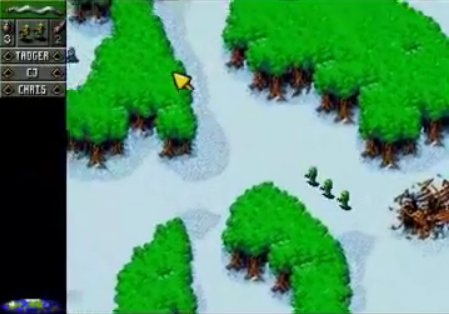 For example, the unit may need to split into two or more groups, leaving one group to defend an area or route, assigning its control to the game's artificial intelligence, while taking control of the other. Each soldier that subsequently survives a mission is promoted and receives a small increase in their rate of fire, accuracy, and range. Lose all men in a mission and the recruits from boot camp will take their place and start the phase again. Run out of recruits and its game over. And that really is all there is to this joyously uncomplicated game. You see the enemy and blow the mothers away! Once you've found your way comfortably around, the difficulty level increases appropriately and begins to provide a somewhat substantial challenge. Twenty-five missions, often sub-divided into various phases (featuring between two to five different map scenarios) with more enemies invading the screen than you can shake a stick at means you're likely to be participant in bloody carnage well into the dwindling twilight. That the enemy begin to hide in the jungle undergrowth, deploy rocket launchers (which are a bugger for a full squad of men to dodge), utilise more powerful vehicles such as helicopters and tanks, and generally aim better than your average intergalactic stormtrooper, is only the start of such difficulties. 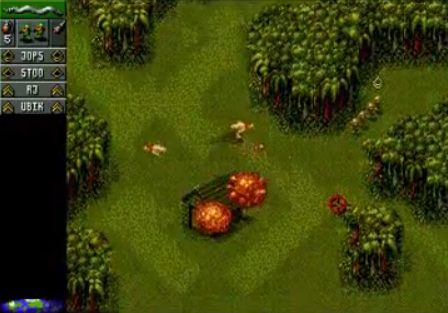 With map sizes getting larger, environmental factors such as trip mines, quicksand, oil barrels, debris from exploding buildings and restless natives (including a comedy farmer who shouts "git off moi land" before blasting both barrels in your troops direction) needing to be navigated, Cannon Fodder is certainly not as easy as the opening scenario would suggest. This is the Sensible Software way. Games that look a piece of piss but actually require time and dedication to master; this equates to instant addictiveness and enduring longevity. The graphics closely follow the style of those in Sensible Soccer with player sprites charmingly represented by small detailed stick men, which for the Amiga's capabilities work so effectively against the detailed backdrops. Just watching the men skid along the ground after being impaled by a bullet, or launched into the air at a stupidly ridiculous ‘cartoon’ height after failing to avoid a grenade is a delight. The same can be said when a casualty is not killed outright - the 'ow' and 'ahs' as an enemy lay bleeding to death in a fountain of blood is just as amusing as it is horrific, because of the quality graphical style. Whilst the in-game sound effects are minimal, each mission is preceded by a rousing rock anthem to get you in the mood for a little blood-letting, followed by a foot-stomping happy track once you've completed the carnage successfully. It is in these small details that make Cannon Fodder as refreshing a game as it is to this day. Additionally, Cannon Fodder features that same offbeat wackiness and enduring quirkiness of their previous titles. 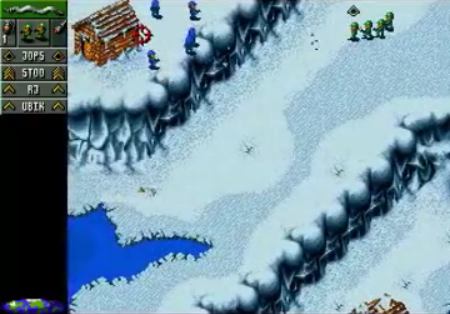 The opening title track “War has never been so much fun” (a technical highlight for the Amiga considering the full length digitised speech of the song) ensured the game courted controversy for glorifying war at the time of its release. However, the game features enough sly, sardonic humour to suggest the Sensible boys were well ahead of Paul Verhoeven and Starship Troopers when taking the piss out of elitist right-wing gung-hoism. Something you don’t quite get from the seriously themed elitist right-wing gung-hoism of Modern Warfare! Some goofs will insist that the in-game facets provide a precedent for the glorification of war, but Cannon Fodder has tongue firmly lodged in cheek. It merely lampoons war particularly how most governments (intentionally and unintentionally) historically regarded the men under their command as little more than cannon fodder. Additionally the mission objectives of ‘kill all enemy’ has a delicious anti-Vietnam sentiment, particular the sweep and clear objectives which indicated a shoot first ask no questions later policy. The opening ‘War’ tune is only really bettered by the home and away styled footy score on the title page which keeps tally of each sides death count (underming the tragedy and understanding of conflict by turning it into a simple numbers game). That the title page also contrasts boot hill, which slowly fills with the mass graves of your dead men whilst new recruits line up on a pathway round the hill to join your army, is blackly comic genius. Yes, Cannon Fodder is fairly subversive, but it's this carnival of silliness that gets across a simple message of war being an utter waste of human life. Better to play a fun computer game simulating such events rather than being an active and exploited participant. Cannon Fodder is effectively the gaming equivalent of Paths of Glory. Whilst a proposed PSP version, sadly, never came to fruition the legacy of Cannon Fodder lives on in pretty much every real-time-strategy game that has followed. 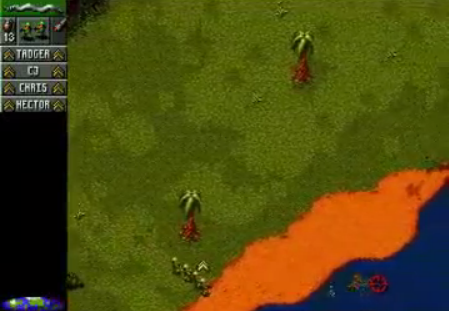 Command and Conquer, for one, owes much to the joyous simplicity of Cannon Fodder. Sure, some of the missions are tougher than vindalooed mutton, to the extent that you begin to sob as long-term fodder ‘Jops’ and ‘Jools’ meet their expected doom. Yet the overtly jolly satire keeps you engrossed throughout and there’s enough strategy involved to allow a certain degree of flexibility in attaining victory, which means you never get truly stuck. Besides, having your men turned regularly into mince-meat is all part of the fun/learning experience! There are few other war games that are as silly or subversive, but these are the very reasons we should all bow down to the majesty of Cannon Fodder – especially if you’re bored stupid of more modern and soulless real-time strategy titles. War has never been so much fun! Damn right.